My office is really coming on now! I will get another post done this week about my initial set up. My holiday next Sunday will sort of cut short my time in the new office, but for good reason so I will write more about how my new office is shaping up on my return. I am loving the ScanSnap and must tell you all about it in a blog post! My first link for this week is a simple GTD and Evernote workflow blog post from Darren Crawford. Darren has set up Evernote as his GTD system. I would love to be able to integrate OmniFocus and Evernote more and this is something I am trying to do with AppleScript. My second link is a link to a post about how one blog author uses the new Microsoft Outlook 2010 for his Getting Things Done system. I used to use Microsoft Outlook before I switched to the Mac and at the time I use PlanPlus from Franklin Covey. This is a good read for those of you using Microsoft Outlook. My third link is a link to a post about Getting Things Done with the Google Tasks Feature from the Tech Tips for Catholics blog. This is an interesting read from a blog with some good resources. I found this via Twitter and a random search on the GTD hashtag! My fourth link is a link to link to a good post that i was reading recently titled 4 Steps for Organizational Agility. This is from the Merchant Stand blog. Akthough not directly related to GTD it does focus on the need to be agile from an organizational perspective. How strange it is to see productive workers working in an organization that does not share the same ethos! My fifth and last link is a link to a part 4 of some great OmniFocus tips for Advanced Users. This tip is about how to use OmniFocus to unlock future projects. I have learned a lot from these posts and they are great reading for all OmniFocus users! I go away on my main summer holiday next Sunday for two weeks in Italy so this is the last post I will be writing live. I will get some scheduled for when I am away and put my trust in the WordPress scheduling system. Also, be sure to follow me on Twitter as I post great Productivity and Motivational links on a daily basis! This entry was posted in General Items, GTD and Productivity Links, GTD General and tagged evernote, Getting Things Done, gtd, omnifocus, Productivity Links, ScanScnap on July 26, 2009 by Andrew Mason. I am eventually back into my home office and I aim to make it as productive as can be! It has been around three weeks in the making and I am very happy with it. I just have to sort out the cabling so it is all hidden and I will also get a blog post written about my findings. I am starting to play with my ScanSnap and Evernote and must admit that I am very happy with the results so far! My first link for this week is a link from the CNN Money website titled Getting Things Done guru goes digital. Quite an interesting post about the GTD and the new digital help we are getting to implement it. My second link is a link to a GTD and Covey Implementation via “Things” [Mac, iPhone]. This is a nice review of a GTD/Covey implementation using pretty much the same hardware as I do, a Mac and an iPhone. I used to be an advocate of the Fraklin Covey system before I discovered GTD! My third link is a link to a blog post titled 7 Ways Less Can Mean More. Interesting post from the Mildly Creative blog that shows you when doing less of one thing gives you more benefit in creativity and productivity! My fourth link is a link to link to Getting Things Gnome! . This is a cool new app for the Linux GUI, Gnome that you must check out if you are a Linux user! My fifth and last link is a link to a part 3 of some great OmniFocus tips for Advanced Users. This tip is about how to use OmniFocus. I have learned a lot from these posts and they are great reading for all OmniFocus users! Hope you have all had a great weekend and heres wishing you all the best for the coming week! This entry was posted in Cool Software, General Items, GTD and Productivity Links, GTD General and tagged Covey, evernote, Franklin Covey, Getting Things Done, gtd, Paperless Office, Productivity Links, ScanSnap on July 19, 2009 by Andrew Mason. I wrote a few weeks ago about my aim to totally revamp my home office and make it a truly productive home office. Well, I just thought I would provide an update as to where I am with this. After deciding to proceed, I removed everything out of my home office and I was amazed with how much clutter I had accumulated over the years. There was no way that I was going to move all of this back into my new office. I removed my wall units and filled the walls to make it a clear canvas! I then had the walls painted and bought a new carpet. I decided on quite a calming creamy brown color that looked both stylish and modern. So, after all this I was left with a nice empty room, and a lot of clutter in my garage! I was originally planning on new office furniture from IKEA but I was very disappointed with the selection. It all looked a bit too cheap and nasty. The build quality of the cabinets was shocking. I then looked at Staples and although the quality was better there was limited selection in the showroom and I would have had to order from a catalogue and I really believe seeing and touching furniture is important. I eventually made a trip to a company local to me that I had used before called JP Office Furniture and I am glad that I did! They took the measurements of my office and made me a great 3D model. They then worked out which products would fit exactly. They provided me with 12 wood samples to take home and I eventually opted for the Walnut. 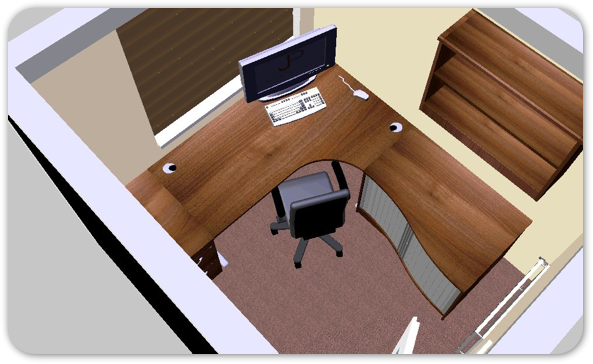 I ordered a great desk, double draw filing cabinet and great curvy cabinet. I will have an acre of desk space and this is one thing that was a requirement for my new office. I also opted for a matching double bookcase wall unit. This was not a cheap option but I think it will be reflected in the quality. The price also includes delivery and installation so I can leave my screwdriver in my toolbox! Below is a graphic of the 3D representation that JP did for me. The good news is that this is now built and ready for me and getting installed in my house tomorrow! I have also ordered and taken delviery of a Drobo, filled with 4TB and a Fujitsu ScanSnap S1500M. There sure will be some posts coming about both of these new toys and my strive for a paperless office! I cannot wait to get off my kitchen table and office floor and back to working on a desk..
Update 2 to come soon, as soon as I get back in my office! This entry was posted in General Items, GTD General and tagged Getting Things Done, gtd, Paperless, Paperless Office, productivity on July 16, 2009 by Andrew Mason. Another week over, and another great week I have had. Caught up with all my emails and sorted some projects. I always love the feeling of getting back to work after a break and being in control rather than out of control as so many are. Hopefully this is the last week without my home office as I expect some movement on this next week. I will write an update post about this in the net couple of days. My first link for this week is a great little blog post about trusting your GTD system. YOu really do have to trust your GTD system as much as you trust your spouse 🙂 Good thought provoking read! My second link is a link to a 25 Free Mac Apps That Will Boost Your Productivity. There are some great apps on here thay you will have heard of and hopefully some that you will not have heard of. One of the gems for me was NameChanger, used it quite a lot already! My third link is a link to a blog post titled GTD: identifying your contexts from fellow GTD Blogger, Dragos Roua. Great post for people who are new to GTD or those already practicing GTD. I must admit that after reading this post I removed a couple of contexts of my own that were dormant. Great post! My fourth link is a link to a quite an old post about Creating a Paperless Office from Productivity501. This is somethign I am going through right now and I can not wait to get my new office sorted so I can move from the kitchen table back into my office! My fifth and last link is a link to a part 2 of some great OmniFocus tips for Advanced Users. This tip is about how to integrate email into OmniFocus. I have learned a lot from these posts and they are great reading for all OmniFocus users! As always, wishing you all a very productive week ahead. This entry was posted in General Items, GTD and Productivity Links, GTD General and tagged Getting Things Done, gtd, GTD Contexts, omnifocus, Paperless Office on July 12, 2009 by Andrew Mason. I have spent the past week on holiday with my family in Northumberland. I lead a very busy life and there is nothing I enjoy more than taking my family away for a great holiday. What amazed me about this break was the simplicity of it and the fact that a lack of a fast Internet connection made me focus on other areas, for the better! I am blessed with a great wife and four great children. They can all sometimes suffer with my busy schedule that often involves time way from home working away. Northumberland is a county on the North East coast of the UK, just above Newcastle. Northumberland is one of the border counties between England and Scotland and because of this there is an amazing array of castles such as Bamburgh Castle (In the picture), Lindisfarne Castle, and my childhood favorite Warkworth Castle. I spent many great holidays in Northumberland when I was a child. The beaches are great and it is a great place for a proper family holiday. We have been to Northumberland for the past three years but we normally go in March when the weather is somewhat cooler. This year we decided to go last week in June and I am glad we did. Taking time away from my busy schedule is quite hard as I do spend a lot of time online and involved in my business. Time take out to ensure you have a mental declutter! I did take my MacBook Air with me and of course my iPhone. I have a Vodafone 3G USB modem which got me a rather unusable connection speed of 20 Kbps. My iPhone was not much better but I could receive email so I could keep in touch with work to ensure I could catch up with and answer any issues that needed my attention. With such bad connectivity I wondered how I was going to survive a week away from high speed Internet and my various daily tools such as Twitter! My 42″ HD TV had been replaced with a 14″ portable with only terrestrial channels! No Nintendo, no PS3, no Blu-Ray, how was I going to manage? The strange thing is that I found it extremely refreshing to be totally disconnected for a week. I took a couple of Moleskine notebooks with me and the down time made me think about different things that enabled me to plan a few projects I had been working on and come up with some great ideas that I may not have had in my usual jam packed day. I managed to collect about 80 new tasks whilst offline. All of these were recorded in my Moleskine. I never make the time to think so having the opportunity to relax and think made me focus on getting things off my mind and onto paper, a great mental declutter! My children are aged from 3 to 9. They had a fantastic time. We were a minutes walk from the beach and they were happy enjoying the simple things in life for the week. No mention was made of a Nintendo or Playstation and they were very happy taking it easy and playing on the beach and sand dunes. I have now been back from my holiday for three days and I am already back into the thick of things but luckily the time spent away was very beneficial and I have updated OmniFocus with a lot of great new projects and tasks. Only three weeks and then I am on my main holiday in Italy for two weeks! This entry was posted in General Items, GTD General, Motivation and tagged Declutter, gtd, Vacation Productivity on July 8, 2009 by Andrew Mason. I am now back from what has been a totally fantastic holiday with my family in Northumberland. I was virtually disconnected for the whole week with only 2G on my iPhone and an unusable 20Kbps through my 3G modem on my MacBook Air. It was actually quite refreshing, especially for somebody like me is spends most of their time awake online in some form or another. I will stop my thoughts here about my holiday as I really want to try to get these down in a blog post tomorrow if time permits. I am writing this on my kitchen table as I still have to get my new home office sorted. I aim to get to Ikea at the start of this week to get my desk and chair sorted then I am hunting for a good filing cabinet. My first link for this week is a great blog post about GTD Hacks from Annie Anderson. In this post Annie presents a few hacks that she implements as part of her own system for getting things done. Great reading and I am happy these hacks are working for Annie and making her more productive. My second link is a link to a post about coping with information overload from Mark Wilson. This is an adapted list from the 2005 issue of Management Today that Mark found after returning from a family holiday. A nice little list of pointers for getting through a work overload. My third link is a link to a blog post titled Rely on Your Inner Strength from Raymond Blanc. This is more of a psychology link than a motivational link but it is a post that I enjoyed so I thought I would share it. My fourth link is a link to a part one of a great series of tips about the Mac GTD Application, OmniFocus. These tips are aimed at the advanced user of OmniFocus and I have liked reading all of these as I would not class myself as a novice user. I will present links to the other parts in this series in future weeks or you can just work them out from the initial post. My fifth and last link is a link to a blog authors top ten iPhone apps. I have not done one of these for a while and with the launch of the iPhone 3G S I thought I would as most of these apps are productivity related. I had never seen SugarSync and I am just checking that out now. Wishing you all a very productive week ahead. I am looking forward to getting my head stuck back into work as I am working on some rather cool projects right now! This entry was posted in General Items, GTD and Productivity Links, GTD General, iPhone Productivity and tagged Getting Things Done, gtd, iphone, omnifocus on July 5, 2009 by Andrew Mason.